"This Malaysian inspired mango dish always has people wanting more." 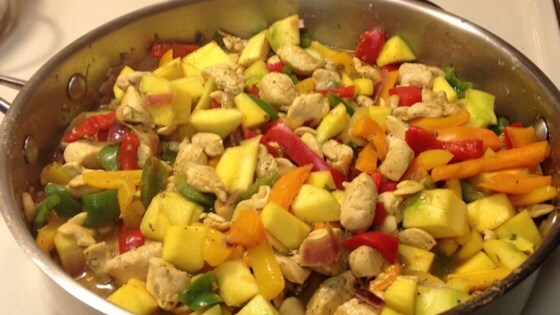 Heat vegetable oil in a large skillet over medium-high heat and stir in the chicken breast. Cook the chicken breast until no longer pink in the center. Transfer cooked chicken to a plate. Meanwhile, whisk together the chicken stock, soy sauce, vinegar, brown sugar, curry powder, and cornstarch. Set aside. Using the same skillet, cook and stir the onion over medium heat until the onion has softened and turned translucent, about 5 minutes. Stir in the green and red bell peppers and cook for 2 minutes, then add the ginger and cook for another minute. Stir in the chicken stock mixture and the cooked chicken breast. Cook until the sauce has thickened. Drop mango in and cook until the mango is heated through. great! I skipped the brown sugar depending on the sweetness of the mango. came out great. also added garlic and turmeric.